The sheen of sweat on my skin is growing thick and vicious. The morning heat has risen and flared into something mean and monstrous. I should run from it but I don’t because I will be gone soon. A light breeze is blowing. I keep looking at the brown reedy waters of the Tapi River hoping they will lend coolness to the breeze but they are just as overwhelmed by the heat as I am. I am sitting under an umbrella for all the good it does. It is mid-afternoon and I’ve just ordered a beer. I am unemployed and underfunded and this is me splurging. The heavyset Thai woman working at the stall beside the river assumed I was a tourist. The night boats leave from here, she was right to assume. “Yoo ti nee” I replied. “Ahhh. Yoo ti nee!” she said, followed by something in Thai that I didn’t understand. I assumed it had to do with ordering. 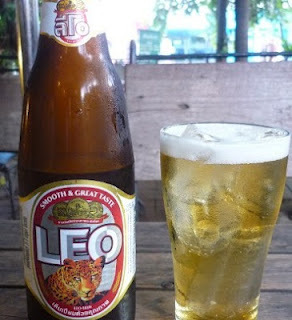 “Beer Leo, kwat yai,” I replied. “Ka!” she said with a smile full of happiness and passion and life. Her country is famous for these smiles and I am stopped short by their honesty every time. I have lived here for almost two years and I cannot speak the language. Oh, you live here! What do you want to order? This is the extent of what I know. I tell people that I stopped trying to learn because I was concentrating on creative writing. “I wrote a novel, it took up all my free time.” That's a lie. I tell people that because it gives me a smart sounding excuse for being lazy. I could have spared a few hours a week to learn the language, but I didn’t, I learned enough to order a beer by the river and washed my hands of it. The heavyset woman brings me a glass and a bucket of ice for my beer. Using metal tongs I drop three cylindrical cubes into the glass and slow pour the beer over them. I was appalled by this in the beginning. Now it feels necessary. Beer comes in big bottles here and its resistance to heat is no better than mine. A group of tourists are sitting down at the table across from me. They are carrying over-sized backpacks and wearing fisherman pants that they will never wear again. They are speaking to the heavyset woman in overly loud voices as if volume will break the language barrier. I could help them. I could make friends. I don’t. I avert my eyes. I’m leaving and not in the mood to make new friends. If I approach they will think I'm a tourist. They will think that we are the same. I am not a tourist. We are not the same. I finish my beer and order another. Dark clouds are rolling in. A strong breeze blows announcing the coming of the rain. I look up and watch the heavy droplets fall. I smile. I know the rains will drench the heat. I know they will not last long. 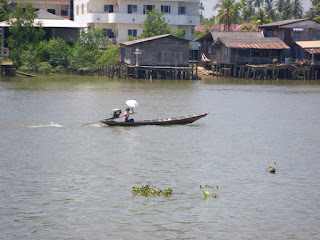 I am looking out at the bridge that connects the mainland to the small river island of Koh Lampoo. I feel out of sorts. I love it here and yet I’m anxious to leave. It is the end of a relationship and I am still enough in love to question my motives and chances of regret. I thought that packing my life into a backpack and moving somewhere far and foreign would be easier this time. It’s not. Coming here I had a job and more money and the comfort of knowing that South East Asia is cheap. In less than a week I will be on my way to the Philippines and ten days after that I will be on my way to Prague. When I think about a life in Europe; the history, the culture, the art and architecture, I want to throw my head back and my arms wide and bath in it. When I think about the cost, and my meager savings, and the difficulty of obtaining a visa, I want to duck my head and tuck my arms and shy away. I am in a place of passing. This is no longer my home and Europe is not yet my home. I want to fight and I can’t. Once the plane touches down and I step onto the ancient streets of Prague I can find work and a place to live. I can create the life I want. I can fight. It will be me against the city and the city does not scare me. Here, sitting beside the Tapi, I am punchless. Tonight, I will go to a party in the jungle; over the bridge and a world away. Tomorrow, I have friends from America visiting. My final guests during my final days in Thailand. I will take them to Khanom, the "local beach" where we will swim and eat cheap food and marvel at the phosphoresce and I will say goodbye to the Thailand of my dreams. When we return I will once again reduce my life to a backpack. I will once again leap into an adventure in a land far away. My beer is finished. The rains have stopped. Prague is waiting. Goodbye, Surat. You are wonderful. You will be missed.